After having issues for so long with falling asleep and staying asleep at night, I finally decided to start trying different solutions instead of just taking Benadryl every night. I tried white noise machines, humidifiers, and even mattress toppers. You know what had the most profound effect? A simple $15 pillow. 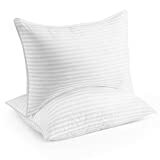 The Beckham Hotel Collection Gel Pillow costs $34 for a pack of 2 Queen size pillows, which is a fraction of what you’ll pay for most memory foam pillows. I personally find it to be the most comfortable pillow I’ve ever slept on, and I’m definitely not alone. It has almost 3,500 5-star reviews on Amazon for a reason, and it’s high time you experience it for yourself.